If you caught our Fiberygoodness live broadcast last night you will have seen this already, the Overdrive, the bigass bobbin and spinning head that is now (probably permanently) afixed to my One Wheel, (my Aura). This is my baby come home! Over the last year of being let into sharing this process with Majacraft, I can tell you, it was like christmas at my house when this finally arrived. It took almost exactly a year from ‘first contact’, and discussing what features and systems a giant Majacraft bobbin would need, to make it something super special.It needed to work well as a ‘production’ wheel as well as keep the Aura characteristics that make it ideal for constructing the architectural yarns I am currently working on and the art yarns that I know many people enjoy spinning. Good things take time, no, I mean.. amazing things! It was so worth the wait. This has the features I already loved about my Aura, large scale. Bypassable orifice and guides, amazing tensioning system, easy treadling, and great visual presence too. And it spins so well, there is almost no transition to make between spinning on the Aura and spinning on the Overdrive, the same tension, the same fine responsiveness, no big difference in weight as the bobbin fills, it treadles the same way throughout. Having spun on ‘other’ large capacity wheels I can say for certain that the difference is the same as if you were to compare say, driving a tractor and then hopping in a Rolls Royce and taking it for a spin, it almost drives itself. But unlike the Rolls, this is no elitist item, if you are used to the Aura you will find this works exactly the same way, but this is not exclusive to the Aura, for Rose and Suzie owners, Andy has designed it so it will fit these wheels too, effectively turning them into Aura style production spinners with a simple (2 minutes max) head exchange. You can find more details about the Overdrive on the Majacraft blog and the Product page on their website. Another super fun part was planning the whole release-launch of this product, and again, I was grateful to be included in that, we found some cool stuff! Like the Bachman Turner OVERDRIVE track Andy posted with the teaser! I wonder how many people see the connection there now? It was a bit obscure.. and you were lucky you didnt get the 70’s video version with the big moustaches and skin tight silk jeans.. OMG! Well lucky THEN, because I am sharing it with you now! I had suggested to Andy that he should sport one of those ‘special’ moustaches for the broadcast, yet somehow he seemed to have not done that.. hmm. Can’t imagine why not. And returning to the broadcast, this was our very first FiberyGoodness broadcast, to talk also about the Golden Fleece course, the modules, and share some of the wonderful work that participants are creating during the course. We are very excited about the technology, the ability to not only broadcast livestreams and keep in touch with course participants that way, but we have plans for setting up our own ‘Spin-ins’ for Golden Fleece students, using this technology for up to ten people at a time, these will not be publicly ‘aired’ but simply a really easy way to get a group of people together with audio and video. 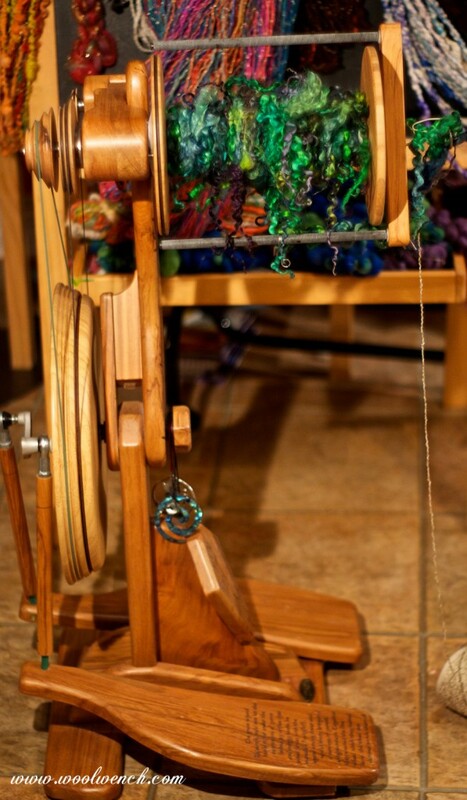 Spinning is often a solitary activity, but it can also be a very social thing to do, and we would like to be a catalyst for growing our Fiberygoodness community by sharing what we learn about this technology. I am really looking forward to some spin dates with people from all over the world! And this is where we are back to the ‘Theme’ of our Fiberygoodness broadcast, community, and the proof that amazing things can happen when you share ideas and work with others, the evolution (revolution!) of the Overdrive, into which a number of people had creative input to the Majacraft design process, the end result being something so many of us can use and enjoy.